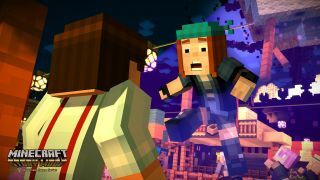 Sooner than rumoured, episode one of Telltale's five-part Minecraft adventure game will launch digitally worldwide on October 13. As in other Telltale series like The Walking Dead and The Wolf Among Us, decisions made in each part will carry through to future episodes, though Story Mode is unlikely to be quite as harrowing. You play as Jesse, on a quest to find the legendary Order of the Stone to counter a threat that might just plunge the world into oblivion. Is it a giant creeper made of creepers? Here's hoping. The story will travel across the overworld, "through the Nether, to the End, and beyond." Unlike other Telltale games, you can customise Jesse's race and gender. There's a decent voice cast too, which includes Corey Feldman and Futurama's Billy West. It's interesting to see how Telltale squeeze facial elasticity out of Minecraft's boxy characters. They haven't done a bad job, if the Minecon trailer is anything to go by.